Life Requires More Than a Whisper of Wisdom. No matter how well our lives may be going, many of us seem to be at our wit’s end when it comes to attaining that next level of success, but there is a solution to this challenge. Whether we want to improve our relationships, spiritual development, emotional well-being, health or monetary ambitions, we so often find that we’re our own greatest enemies. How does one start this process? Become a student of your own history and become an intellectual maverick, says Pencilliah, who reviews the attributes that must be developed to make progress possible. • Irrevocably change your world. Piece together an ever-fuller understanding of yourself with the intention of reinventing yourself a thousand-fold. We should always aim toward exponential achievements, with the wisdom of knowing that we are not chasing the achievement, but rather chasing the consciousness of who we need to become in order to materialize our success. • Think with sophistication. This is your capacity to become more strategic in your approach to life. This simply means that you need to become more process-oriented, rather than goal-oriented. Intelligence is knowing what’s required of you. Sophisticated thinking is the process of making successful decisions over a lifetime. • Exceed probability amplitudes. Achieving success in any arena of your life is framed within your ability to eliminate innate weaknesses and biases. History tells us that not all greats have off-the-chart IQs, nor are they born with limitless freedom. In fact, it’s the triumph over less-than-favorable circumstances and a determination to achieve that often builds the character necessary for success. Great individuals set out to achieve outstanding results, and make their decisions within intellectual criteria. All the greats have engaged a higher impulse, a higher bandwidth, and an inherent strength. • Smile with radiance. Life is beauty in every direction, but we are often unable to see it if we are too consumed with our lives. The simple truth is that you can touch more of the beauty of life only by touching your own beauty. If you look through the lens of love, gratitude and contribution, then you will be able to see and touch more of the infinite beauty that makes life on Earth a heaven. Learn to smile like sunshine every day and brighten up your world. We are all endowed with the ability to achieve success in any facet of our lives; success is framed within the definition of the analytical tools and emotional disciplines necessary to champion your life forward, he says. Julian Pencilliah, (www.julianpencilliah.com), is the author of the new book, The Jetstream of Success, (www.thejetstreamofsuccess.com), which is an Amazon Top 10 e-book best sellers in the self-help category. As a venture capitalist, he has taken a bold approach to life, which includes 20 years of accomplished business acumen. Whether it’s going face-to-face on a dive with great white sharks in the depths of the Atlantic, racing Formula One cars throughout the world or being on a game drive with Virgin billionaire Sir Richard Branson, Pencilliah’s lifestyle has served as a platform for him to draw analogies to connect with readers. This allows the reader to stitch together an ever-fuller understanding of their self, enabling progress toward their ambitions. When you send a hand-written letter to your best friend on the occasion of her wedding, you don’t rush the note. When a long-term patient needs to hear your plan on how she will beat the cancer you just found, you don’t rush the meeting. When your best customer just discovered that his critical shipment is totally messed up, you don’t rush the phone call. The problem is this: we’ve scaled the number of contacts, of patients, of Christmas card recipients, of Twitter followers, of email correspondents, of investors, of backers, of Kickstarter supporters, of readers, of correspondents, of co-workers, of… we’ve scaled it all. And the one thing we can’t do is scale our ability to take time. So, this year, when you sent out 500 cards, of course you didn’t take the time to handwrite each one with a personal note. How could you? And recently, when you sent a blast to 500 donors announcing a matching grant, you didn’t personalize each note and leave out the people you told personally, because, hey, it’s a huge list… how could you? Treat different people differently. You decided to get bigger, but you won’t be able to treat everyone the way you used to. That was your decision, and it’s one of the costs of bigger. Treating different people differently is the only way you’ve got to be able to take your time with the few, because, alas, you can no longer take your time with everyone. And if you can’t live with that, get smaller! Over time, as others figured out how to make things just as well as the ‘luxury’ brands could (the triumph of industrialism), the label on the item, the brand, became at least as important as what was made. The brand is a tribal signifier, a way of demonstrating good taste and a membership in the elite. People pay extra partly for the privilege of paying extra. For a very long time, a sale on luxury goods made no sense, because the fact that it wasn’t on sale was precisely what made it a luxury good. It’s this selling of the logo, of Hermes or Chanel or Champagne that made the last fifty years of luxury production such an extraordinary opportunity. Add to this a growing cadre of the newly wealthy, eager for a badge, and it’s nearly perfect. Feed the tribe, maintain the value of the logo and you actually get paid a premium for making the thing cost more. And then, the outlet stores showed up and Ralph Lauren danced the line between mass and class, selling logos big and small, at all price points. When anyone can make a nice shirt, which nice shirt should you pay extra for? H&M took this even further. There’s still plenty of money being spent on the expensive, but the concentation of brand impact is diluting, quickly. Here’s what shifted just recently: In the post-industrial connection economy, we often value networks more than we value stuff. We’d rather have a working smart phone than a fancy car. We’d rather be invited to the right conferences than wear expensive shoes. Logos are worth less, easier to copy and not as valuable a tribal signifier as they were. And yet elites (of all kinds) still desire a way to demonstrate their inclusion into certain groups, groups that aren’t open to all. And human beings still seek out the best of something, the item that carries with it the magic of a trained hand, of a bespoke origin and of the nostalgia for the special thing we remember. I don’t think think the luxury industry will disappear, but without a doubt, it is changing. Charging more is one tactic, but it might not be the only one. I’ll be speaking on this in Paris in early July. The organizers of the event tell me that code SETH-GODIN-GUEST saves you (ironically) about 30%. It remains one of the greatest travesties in the history of American business: In 2001, the 85,000 employees of one of the world’s largest accounting firms began losing their jobs in droves. Their employer had become tainted by its loose association with Enron Corp., a financial house of cards that was imploding and taking with it billions of dollars in employee pensions and shareholder investments. In 2002, accounting firm Arthur Andersen was convicted of charges related to Enron’s fraudulent practices. The charges had nothing to do with the quality of their auditing – or any of Enron’s illicit practices. The conviction was appealed, and in 2005, the U.S. Supreme Court struck it down in a unanimous vote. But the damage had already been done. To date, despite millions of records being subpoenaed, there is no evidence Arthur Andersen ever did anything wrong. Still, perceptions are everything: Most people are not aware that the accounting firm, which led the industry in establishing strict, high standards, became a government scapegoat. When I speak to groups across the country, I ask the following questions. Below are the typical responses I receive – and the actual facts. 1. What do you remember about Arthur Andersen? Typical Response: They were the ones that helped facilitate the Enron fraud. They deserved what they got. Fact: Arthur Andersen was the largest and most prestigious firm in the country. It was considered the gold standard of the accounting profession by the business community. 2. For what was Arthur Andersen indicted? Typical Response: They messed up the audit of Enron and signed off on false financial statements. Fact: They were indicted for shredding documents. These documents were drafts and other items that do not support the final product. All accounting firms establish policies for routinely shredding such documents. 3. How long was it between the Enron blowup and when Arthur Andersen went out of business? Typical Response: One to three years. Fact: The largest accounting firm in the world was gone in 90 days. 4. Was the indictment upheld? Typical Response: Yes, that is why they went out of business. Fact: No. The Supreme Court overruled the lower court in a 9-0 decision, and came to the conclusion within weeks, making it one of their quickest decisions ever. 5. How many people lost their jobs as a result of the false accusations? Typical Response: Have no idea, but the partners got what they deserved. Fact: Eighty-five thousand people lost their jobs and only a few thousand were partners. Most were staff people and clericals who made modest sums of money. 6. Who benefited from Arthur Andersen going out of business? Typical Response: Everyone – we finally got rid of those crooks and made a statement to the rest of business to operate ethically. Facts: It was not the Arthur Andersen people; they lost their jobs. It was not the clients; they had to go through the stress and expense of finding a new auditing firm. It was not the business world in general: It now has fewer firms from which to choose and rates increased. It was their competitors who benefited– they got Andersen’s best people and clients and were able to increase their rates and profitability. 7. What accounting firms now have ex Arthur Andersen partners playing leadership roles in their firms? Facts: The “big four,” all the large middle-tier firms and many small firms have former Arthur Andersen partners in leadership positions. Finally, many members of the new Public Accounting oversight Board (PCAOB), which oversees these firms, now have former Arthur Andersen people involved in reviewing the quality of these firms. Larry Katzen, author of “And You Thought Accountants were Boring – My Life Inside Arthur Andersen,” (www.LarryRKatzen.com), worked at Arthur Andersen from 1967 to 2002, quickly rising through the ranks to become a partner at age 30. His new memoir details the government’s unjust persecution of a company known for maintaining the highest standards. I dare you to watch this without crying at least a few tears of joy!!! An avalanche on Mount Everest early on Friday has killed at least 12 local climbers and left several others injured in what is likely to prove one of the most lethal accidents in recent history on the world’s highest peak. Officials said 12 bodies had so far been recovered and ferried to base camp, while a further three injured climbers were being taken to Kathmandu. As many as four climbers are still thought to be missing. An injured survivor told his relatives that the path up the mountain was unstable just before the avalanche. As soon as the avalanche hit, rescuers and climbers rushed to help. Reports suggest a massive avalanche low on the 29,000ft (8,848m) mountain caught a work party of local sherpas as they prepared the classic South Col route – followed by the peak’s first ascensionists in 1953 – for fee-paying western climbers. Sherpa guides had gone early in the morning to fix the ropes which will guide and safeguard hundreds of climbers, when the avalanche hit them. Reports said the accident had occurred between base camp and Camp 1 in the chaotic and extremely dangerous ice fall. The ice fall is composed of a steep glacier which fractures as it slides over cliffs, forming massive crevasses, and sherpas have to find and maintain a new route through every year. Tourism ministry spokesman Mohan Krishna Sapkota said the climbers were all Nepalese and were preparing the route to the summit ahead of the summer climbing season which kicks off later this month. “The sherpa guides were carrying up equipment and other necessities for climbers, when the disaster happened,” Sapkota said. Base camp is currently crowded as peak climbing season on Everest approaches. A weather window in May allows the greatest chance of success on the mountain. In recent years there has been growing controversy over the pay, conditions and safety of the local men hired for the risky job of securing the route on the mountain to allow largely western climbers on commercial expeditions charging up to $50,000 (£30,000) to reach the upper slopes of the mountain in relative security. The Kathmandu-based climbing company Himalayan Climbing GuidesNepal confirmed that two of its guides were among the dead and four were missing. “Six climbing guides from our company were taking up tents and supplies … two have been found dead and rescue teams are searching for the remaining four,” manager Umid Bhandari told AFP. Eight people died on Everest last year, including one of the best-known and experienced local sherpa guides who was killed in the ice fall. The accident will once again raise fears that the mountain is too crowded. Nepalese authorities have introduced a series of measures to reduce the number of climbers on the peak. Last year more than 500 climbers reached the summit of Everest. On 19 May around 150 climbed the last 915m to the peak within hours of each other, causing lengthy delays as mountaineers queued to descend or ascend harder sections. Officials have cut mountaineering fees for many other peaks while requiring each climber scaling Everest to bring back 8kg (17.6lbs) of rubbish in an attempt to clean up the “roof of the world”. Last year officials floated the idea of installing a ladder on the famous Hillary Step, a crucial stretch of technical climbing at nearly 8,840m (29,000ft) on Everest, named after its first climber, Sir Edmund Hillary. Though such innovations are anathema to many purist climbers, some sherpas welcome them. Entire communities in the otherwise poor Khumbu region of Nepal depend on the mountaineering industry for their livelihoods. Relations between international climbers and sherpa guides working on the mountain are not always good. 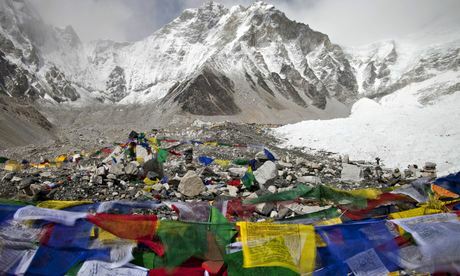 Authorities have also stationed soldiers and police at Everest base camp following a brawl between commercial climbers and Nepalese guides last year. At Monday’s Boston Marathon, many runners will be on the course to honor the 16 people who lost limbs in last year’s bombing. One married couple was among them: Jessica Kensky and Patrick Downes. Among many dark stories of that day, theirs is among the darkest. They were newlyweds of just seven months when each had their left leg blown off. Their injuries were so severe that they were some of the last victims to leave the hospital. But we want to tell you an encouraging part of their story. It involves an 80-pound black Labrador retriever named Rescue who is specially trained as an assistance dog. Newlyweds Jessica Kensky and Patrick Downes each lost a leg in the Boston Marathon bombing. Rescue the assistance dog helps fetch keys and push buttons, bringing warmth and joy as the couple recovers. To understand why Rescue came into their lives, you have to know how badly Kensky in particular was hurt. Her remaining leg, the one that wasn’t amputated, was so mutilated in the bombing that one doctor thought it should be surgically removed, too. So surgeons reconstructed Kensky’s right leg as well as they were able to. So far, her “good” leg really isn’t so good. Kensky wears a high-tech brace on her right leg, which greatly improves her mobility. When she removes the brace, she exposes her misshapen foot and ankle, and a heel no longer as round and padded. She sometimes needs a wheelchair, because walking on her remaining leg is difficult. Every day, that pain has her asking herself an excruciating question. That gets us back to Rescue. Kensky got Rescue from a Massachusetts nonprofit called NEADS, which trains assistance dogs for people with disabilities. NEADS is offering a free service dog to any marathon bombing victim with a permanent physical disability. Kensky, because of her continuing mobility problems, is the first to accept that offer. Rescue steadies her when she walks on crutches or with her prosthetic. But that’s not all he does. 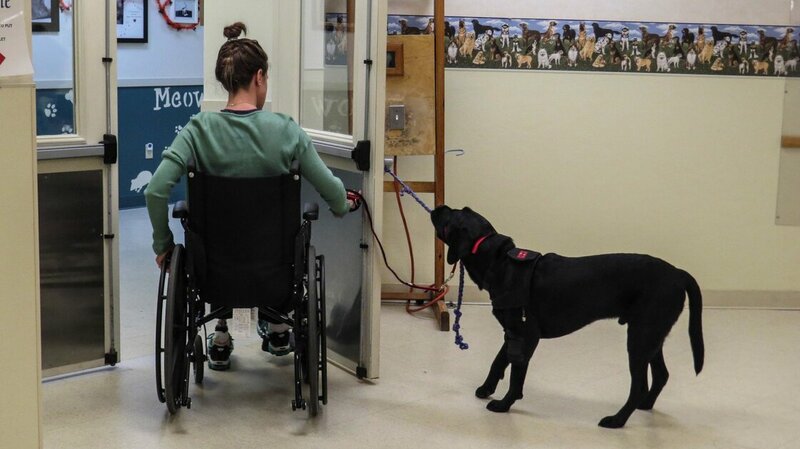 “Come on — nudge!” she prompts him, and Rescue uses his paws to press an elevator button in Downes and Kensky’s new handicapped-accessible apartment building. “Good boy!” she says. When Kensky drops her keys — “Rescue, fetch!” — the dog picks them up with his mouth and brings them to her. Rescue can also open doors and retrieve a phone with his teeth — even if he drops it a few times and presses a few numbers in the process. Having a dog also keeps Kensky and Downes physically active — a challenge for amputees. Kensky and Downes have both had a pretty grim year. She’s 33 and hasn’t been able to return to her job as an oncology nurse. He’s 30 and had to abandon his plan to do a pre-doctoral program in San Francisco, where they had been planning to relocate. They also suffered shrapnel wounds and perforated eardrums. Since the bombing, they’ve had nearly 30 surgeries between them, with more operations ahead. Amid all that, Downes says, Rescue has also had an intangible value just as important as his physical assistance. At that, Rescue heads for a blanket across the room. As he drags it back to her, getting it comically tangled in his paws, you realize how a smart, lovable dog who brings laughter to a house that hasn’t heard much of it in the past year can be a transforming presence.